Eliminator Demon Drive Bass Drum Pedal, Double Bass Drum Pedal from Pearl. 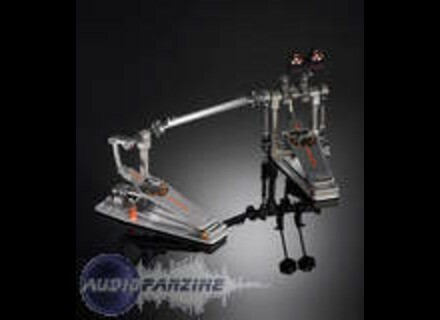 This bass drum pedal has "Duo-Deck", a convertible footboard: Through a simple adjustment, the Demon Drive pedal can be adjusted from a traditional shortboard to a longboard pedal. Additional features include the two-position Beater Stroke Adjustment and two-position Direct Link Adjustment. Both adjustable features are designed to allow the player to create a slightly lighter or heavier feel of the pedal depending on their preferred setting. Adjusting the Duo-Deck in combination with the Beater Holder and Direct Link Adjustments yields 8 possible Pedal Configurations,. Other features include adjustable footboard angle and beater angle, the Click-Lock spring tension system, Ninja ball bearings, and Pearl's new felt and wood Control Core Beaters. Also available in a double pedal configuration with Z-Link universal joints designed for absolute zero latency, producing incredible speed, finesse and control. [NAMM] Pearl LE Mahogany Pack Pearl will be releasing a special, limited edition African Mahogany 4 piece shell pack in 2009.